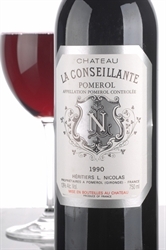 A sleeper of the vintage, this impressive, full-bodied, surprisingly concentrated 2008 offers an opaque ruby/purple color as well as a glorious perfume of lead pencil shavings, spring flowers, blueberry liqueur and cassis. This is a full-throttle effort filled with blueberry and black raspberry fruit, perhaps slightly more oak than oakaphobes would prefer, but a full-bodied, concentrated, ageworthy style. 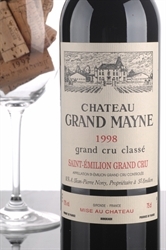 A consistent winner in both quality and value, the dark plum/garnet-tinged 2000 Grand-Mayne reveals a sweet nose of blueberry pie intermixed with forest floor and floral undertones. 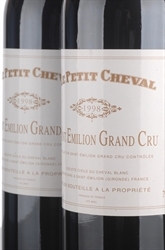 This cuvee exhibits a dark ruby color (with much less saturation than many wines of the vintage) as well as a distinctive, herbal, meaty, horsey nose, medium to full body, good depth, power, and richness, and soft tannins. The 2009 Haut-Batailley is a delicate, finesse-styled wine exhibiting a dense ruby/purple color as well as plenty of sweet black cherry, mulberry and wild mountain berry fruit intermixed with notes of foresty underbrush. 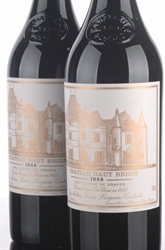 Deep plum, currant, and mineral notes emerge from the concentrated, beautifully balanced, pure 1999 Haut Brion. 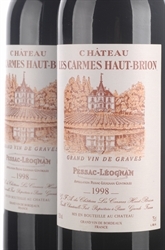 This deep ruby/garnet-hued 1990 reveals considerable amber at the edge as well as a knock-out bouquet of cedar, kirsch, licorice, roasted herbs, and spice box. 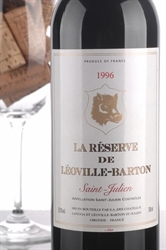 This has much of the style of the 1990, with supple tannin and loads of spicy fruitcake, licorice, cassis and kirsch-like notes that jump from this dense ruby/purple wine. Composed of 70% Merlot, 20% Cabernet Franc and 10% Cabernet Sauvignon, some of the abrasive tannins noticeable early on in this big wine (14.5% alcohol) are now sweeter and better integrated. 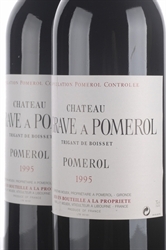 Owned by Christian Moueix, La Grave a Pomerol exhibits a character similar to Petrus, although never the mass, concentration, or power of that great estate. A pretty red with lots of ripe berry, tobacco character with hints of chocolate. 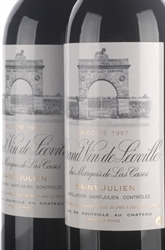 This opaque purple-colored, muscular, full-bodied, classically made St.-Julien displays impressive concentration, chewy, highly-extracted flavors of black fruits, iron, earth, and spicy wood, and a powerful mouth-feel. 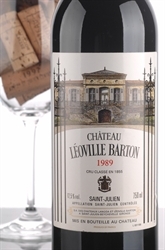 If it were not for the prodigious 1996, everyone would be concentrating on getting their hands on a few bottles of the fabulous 1995 Leoville-Las-Cases, which is one of the vintage's great success stories. 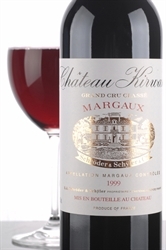 This dark ruby/purple-colored 1999 is an elegant, soft, tobacco-infused, red currant and cherry-flavored effort.